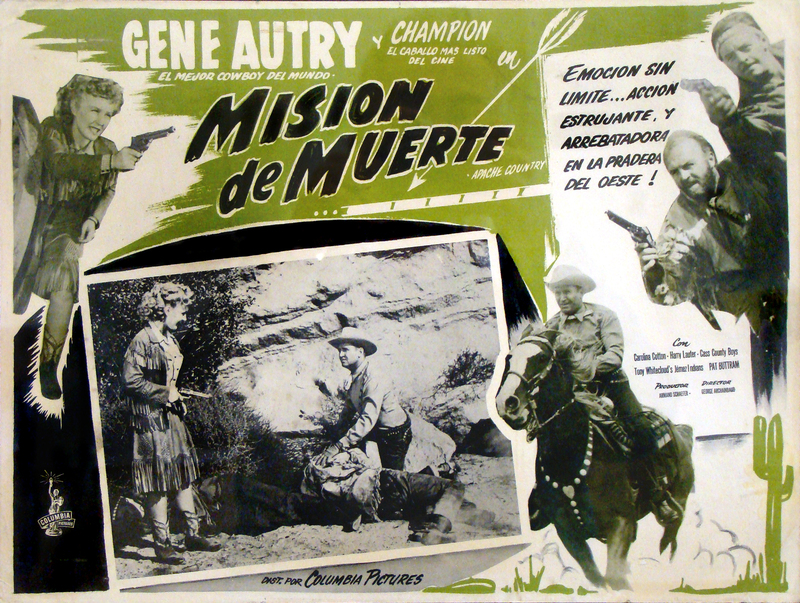 SCVHistory.com LW2330 | Melody Ranch | Mexican Lobby Card: Gene Autry in 'Apache Country' ('Mision de Muerte'), 1952. Mexican Lobby Card for "Apache Country"
Mexican lobby card for Gene Autry's "Apache Country"  in Spanish, "Mission de Muerte" or "Mission of Death"  filmed at the Monogram Ranch in Placeirta Canyon. A year later, Autry bought the place and renamed it Melody Ranch. Westerns of the period were just as popular south of the border as they were in the United States, and lobby cards were usually printed in Spanish  as well as French, Italian and other languages for European audiences. The standard card that was displayed in lobbies of movie theaters in Mexico were about 12½x16½", larger than the standard U.S. size of 11x14". Iron Eyes Cody and Ken's brother, stuntman Kermit Maynard, make uncredited appearances in this film; The Cass County Boys provide music and Tony Whitecloud's Jemez Indians dance. Made by Gene Autry Productions (Armand Schaefer, producer) while Autry was under contract with Columbia Pictures, "Apache Country" was directed by George Archainbaud, written by Norman S. Hall, and features Autry ("El mejor cowboy del mundo!") and his horse Champion ("El caballo mas listo de cine"  the smartest movie horse) with Pat Buttram, Carolina Cotton, Harry Lauter, Mary Scott, Sydney Mason, Francis X. Bushman, Gregg Barton, Tom London, Byron Foulger, Frank Matts and Mickey Simpson. The tag line reads: "Emocion sin limite ... Accion estrujante, y arrebatadora en la pradera del oeste!"  "Emotion without limit ... Gripping action, sweeping the Western prairie." LW2330: 9600 dpi jpeg from original photograph purchased by Leon Worden.